I mentioned that as a result of some work that I am doing, I am noticing accounting/reporting errors that public companies are making and their auditors appear to be missing in reports that I analyze. Here is another example. 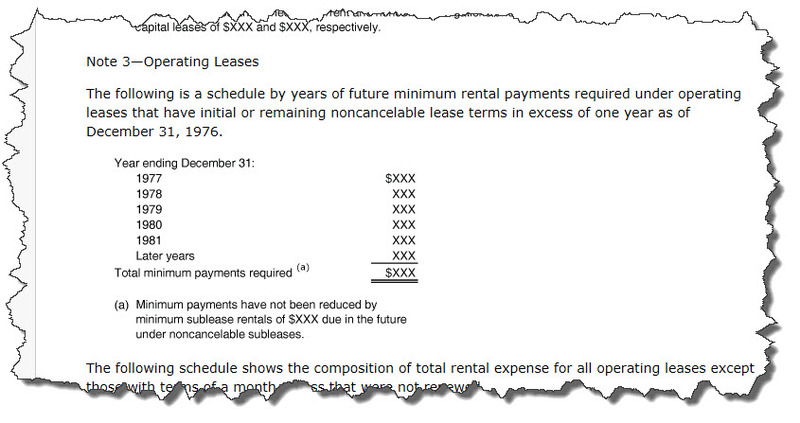 I am analyzing future minimum payments due under non-cancelable leases of a lessee which is a relatively simple and very standard disclosure. Notice how the accounting rules state, "..., in the aggregate and for each of the five succeeding fiscal years." Further, the Wiley GAAP Guide disclosure checklist, the AICPA disclosure checklist, the KPMG disclosure checklist, and the Loscalzo Associates disclosure checklist all state exactly the same thing. I have run this by several other CPAs and all of them read the ASC the same way that I do. Now, honestly, I find that ASC description somewhat lacking. It does not seem to discuss the "thereafter" line item. It talks about the "five succeeding fiscal years" but it does not mention the "thereafter" line item which is necessary. I ran across another error in the US GAAP XBRL Taxonomy. The US GAAP XBRL Taxonomy appears to be missing a Level 3 Disclosure Text Block that relates to the lessor disclosure of future minimum payments receivable. The US GAAP XBRL Taxonomy only seems to provide the lessee disclosure. That is a different disclosure, but I ran across 46 public companies that were using the same Level 3 Text Block (i.e. for the lessee disclosure) for the lessor disclosure. Those are two different disclosures so they really need two different text blocks. It is looking like Marthinus Cornelius Gerber, Aurona Jacoba Gerber, and Alta van der Merwe were correct. In their paper, An analysis of fundamental concepts in the conceptual framework using ontology technologies, they explain how an ontology can be used to check the conceptual framework of a reporting scheme. I am using a conceptual model and lots of business rules. But in essence, we are doing the same thing. Also, this is one step closer to what Jun Dai and Miklos Vasarhelyi of Rutgers University call Audit 4.0 in their paper, Imagineering Audit 4.0. Granted, what I am doing is still rudimentary, but it is definitely a start. Welcome to the Digital Age of accounting, reporting, and auditing.